Local SEO is the flavor of the day and Bruce, Jessica, Susan and Virginia start off the show looking at local search statistics. According to Google in April 2010, 20% of all searches done with their search engine have local intent. As of this month, one in three mobile searches on Google have local intent. And last December, Google displayed a map in search results for one in every 13 results pages. Local SEO is a fact of business today, and LocalPack provides business owners with a streamlined and simple way to claim and manage their profile across the Web’s major local listings and directory sites. Chris Travers, co-founder of business profile management service Universal Business Listings, talks to Virginia about optimization tactics for a business profile and how awareness of local search optimization’s importance can spread to the small business community. He also explains that accuracy and consistency are the most important factors of business listing success, and what fields in a profile should be the same and which can differ across sites. UBL.org also offers an online reputation management tracking service that notifies a business of mentions and reviews, helping the business manage their online presence. Then Susan, Virginia and Michael take a look at the line up for this month’s SEO Newsletter, the 83rd of its kind! There are a number of SEO training dates scheduled through the end of the year, in October and November on the West Coast and October on the East Coast. Also, former students who took the course before July 2010 can receive a 25% discount on the cost of training. The SEO Newsletter also features an article on local search and SEO copywriting. Search marketers are always looking for new optimization opportunities, be it through keyword research or search trends or newly identified personas, and more. Google has started a video series called Google Beat where they explain the week’s trending searches, using data from Google Insights and Google Trends. These tools are available to the public and can be used at anytime to identify upcoming popular topics worth optimizing. The videos are also further evidence of the increasingly critical need for video content online. Google’s also on the cutting edge of SERP speed with the release of Google Instant. A predictive search engine results experience that displays results based on each additional letter typed by a searcher, Google Instant has an effect on SEM. Search suggestions will cause new keyword optimization opportunities and PPC campaigns will gravitate away from the long-tail terms. Google Instant may also reduce ORM needs as negative suggestions seem to be censored in the search enhancement. Then Paula, Susan and Virginia return to the topic of online video to discuss technical implementation from hosting to on-page optimization. YouTube is a powerful platform for getting your video in front of viewers, but YouTube has been blamed for cannibalizing a business’s site traffic by adding additional steps to the conversion process. Some tactics to make YouTube work for a business include making the URL for the company website copyable and including an easy to see link in the description as well as posting a shorter version of a video on YouTube in order to entice viewers to see more and then including the full-length video on the business site. With Bing now officially powering Yahoo!’s index, the question of how the partnership affects users and search engine marketers is pressing. However, there is evidence that Yahoo! will retain its own algorithm as the BOSS API remains available and the engine has maintained that it has not quit the search business. Analysts have also raised the difference between search market share and search engine yield. While Yahoo! and Bing’s partnership may consolidate the pair’s search engine market share in the engines’ competition with Google, a combined search engine yield may actually drop. Brent Rangen, owner of Optimize Guyz and the winner of the Small Biz Discovery Contest, then talks to Virginia about his recommendations for small business SEO and his takeaways from SES San Francisco. His entry to the contest was an SEO primer that covered off-site and on-page optimization, keyword research and analytics. 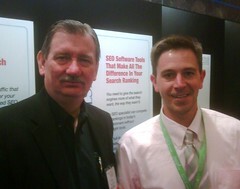 At SES he reported on an SEO Lab with Google’s Maile Ohye. He shares his thoughts on the multiplying effect of social media on marketing efforts and why a blog is one of the most powerful tools a business can leverage to improve their online presence. Finally, Susan, Paula and Virginia discuss Google’s algorithm change which seeks to deliver on a user’s intent to receive multiple results from a single domain. Ian Lurie warns that webmasters should not be confident as the update only affects the strongest brands. David Harry notes that the change seems to have wiped out negative results and suggestions when brands are searched for.